Help us celebrate big wins across Washington! Thanks to your hard work, support, and energy, Manka Dhingra has been elected to State Senate in the 45th Legislative District and Don Orange in the Port of Vancouver. With Manka’s win, Washington state now has a pro-environmental Governor and majorities in the House and Senate, creating a block of pro-environmental states along the entire West Coast. “This is a historic win. It proves once again, when given the choice, voters in East King County and across the state will elect environmental champions. This puts environmental protection back on offense in the legislature,” said Joan Crooks, CEO of Washington Conservation Voters. “Everything is now on the table in 2018 – with this win, Washington can start tackling climate pollution, transitioning to a clean energy economy, and make headway restoring Puget Sound. Share Manka’s image on Facebook to celebrate! 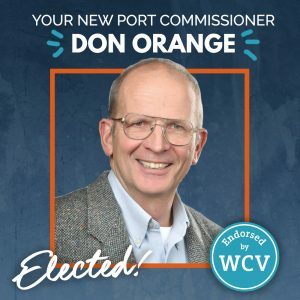 And due to hundreds of volunteers knocking on doors in Vancouver and countless supporters, donors, and volunteers, Don Orange is the new Port Commissioner. Share Don’s image on Facebook to celebrate!